We love books in my house. (Well, most of us do; Seahawk might be the exception.) We especially love reading books together, and if we can make it a school lesson, all the better. When the option for a review of a Progeny Press study guide was offered, I was super excited. When I found out one of the options for my kids’ age range was Little House in the Big Woods, I was even more excited. Will had read this book to the boys a couple of years ago, but I had never read it. Ever. As a child or as an adult. Can you believe that? Me neither. So I expressed high interest in getting my hands on this guide. What is Progeny Press? I’m glad you asked! The short answer is that they are a company that provides “study guides for literature, from a Christian perspective” (quoted from their website). They have study guides for over 100 books available on their website, ranging from classics like Little House in the Big Woods and Charlotte’s Web to current popular novels like The Hunger Games.The guides cover a wide age range, starting in lower elementary (grades K-3) and going all the way up through high school guides (grades 9-12). Because of the age of my kids, I obviously chose one in the “Upper Elementary” range – grades 3-5. Their prices are quite reasonable – most of the guides are between $11.99 and $21.99. Little House in the Big Woods, the one I am reviewing today, costs $16.99. What you get for that price is a digital download, available immediately. You have two choices of what to do with your download. You can print it off and bind it, which is what I did, or you can have your student(s) type right into the PDF. That’s right – it’s fully interactive! (This option is available for many of the guides, but not all of them.) For older students or families who aren’t worried about their kids’ computer time, this would be a wonderful option to save the cost of printing. I went ahead and printed ours for two reasons: first, because we want our kids to limit their screen time, and second because I was having both boys work on it. Printing multiple copies is allowed within a single family, so this was the perfect solution for us. After printing, I used comb-binding to hold them together (this was done for free at my church) into “official” workbooks. 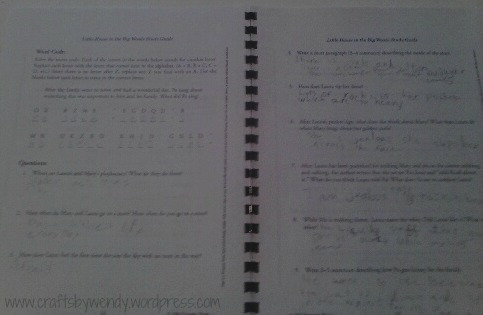 For an extra dollar, you can have a pre-printed workbook instead of the digital download that you print yourself. For the same price as the interactive PDF, you can get a CD with the study guide on it mailed to you for printing on your own. The benefit to the PDF or CD is, of course, that you can use it with multiple students within the same home. A pre-printed workbook would require one per student. Progeny Press study guides take between 4-10 weeks to complete, depending on the complexity of the book. It took us about six weeks to work through our study. They recommend that you have your student read the book in its entirety during the first week of the literature unit and then work through the study guide for the remainder of the weeks until it’s done. We didn’t do this. We chose to do the book as a read-aloud (remember when I said I hadn’t read it before? ), and I knew that it would work better with my kids if we did the questions and activities as we read instead of bulking up on one and then the other. The study guide is split up into two-chapter chunks, except the very last section which covers the final three chapters of the memoir. So we would read one chapter a day (occasionally two, if the boys were “feeling” it and my voice wasn’t too tired) and then spend three or four days working through the questions, vocabulary words, and activities in the guide. I really liked the questions they asked because they pushed the kids to not only be able to regurgitate what they’d heard, but also to think through why certain things happened in the book the way they did. Additionally, there were Bible tie-in questions included in each section, hence the “from a Christian perspective” tagline that Progeny boasts. After the questions that deal strictly with the text, there’s a Bible verse or two (printed right in the study guide) and questions about how the kids think that section of Scripture applies to the chapters read. For example, in the chapter that shows us Laura being jealous of Mary’s golden curls, the study guide reminds us of 1 Peter 3:3-4 (Your beauty should not come from outward adornment…) and 1 Samuel 16:7 (The Lord does not look at things man looks at…). Then students are asked to ponder what beauty is. So, you read a book and answer a bunch of questions. That’s it, right? 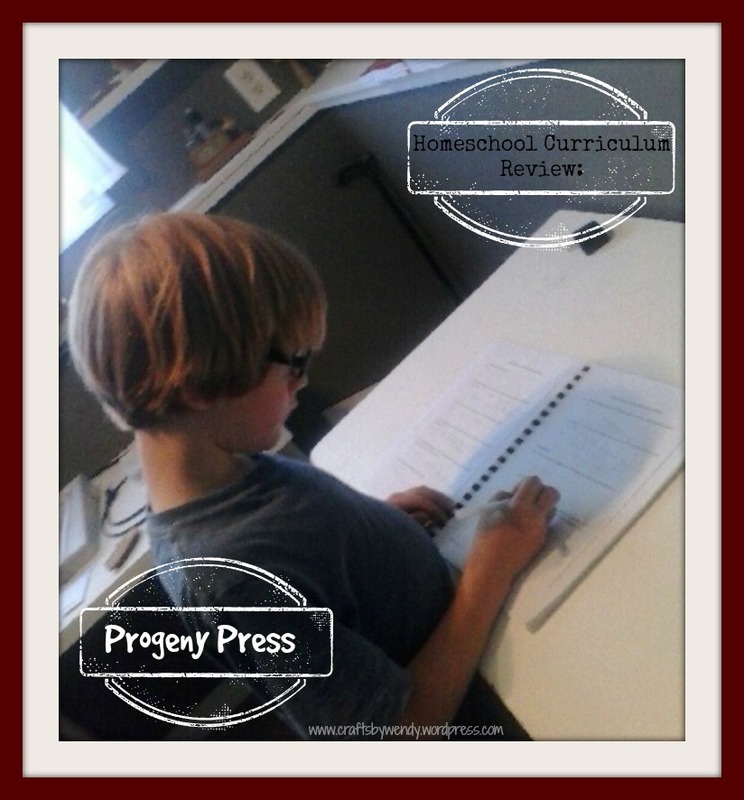 Progeny Press study guides also offer several activity options to go along with each section. Our favorite thing to do with our study guide went along with the chapter that describes Pa whittling a shelf out of wood for Ma. 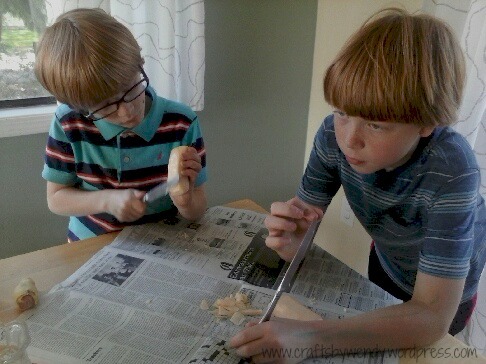 The boys got to try their hand at whittling! Instead of wood and a sharp knife, they used soap and a butter knife. They absolutely loved this activity! 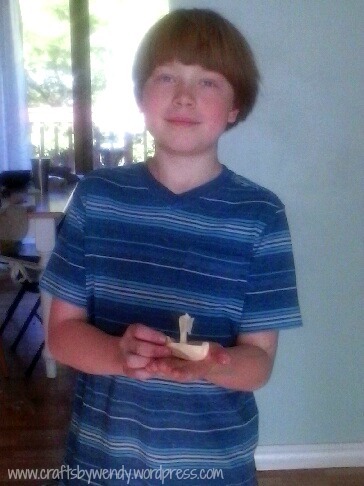 Their grandfather (Will’s dad) is big into whittling, and they’ve seen him do it loads of times, so they were pumped to try it themselves, especially Seahawk. In the end, Seahawk made a boat and Munchkin made a car. Other activities that corresponded with the book included going sledding (we never get enough snow for that, and besides, it’s spring! ), making butter (ours never got firm enough to “wash”), watching a video about cheese making and honey collecting (thank goodness for YouTube! ), and making Johnny cake (still on our to-do list). The long and the short of it is this: this study guide was absolutely amazing. 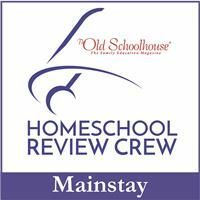 If the others are as good as this one – and I have no reason to doubt that they are – they are definitely worth getting, especially if you try to run a literature-rich homeschool like I do. My recommendation would be to get either the PDF download or the CD over the printed workbook, though, especially if you have kids in varying age ranges. This way, one purchase covers you for all your kids; you can keep the files and print new ones as younger kids “grow into” the books. Oh, and one other thing you need to be aware of: these guides do not come with the literature. You have to provide that yourself. But most of the titles are easily found in a well-stocked public library. Now, what are you still doing here? 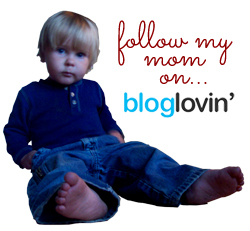 Head on over to Progeny Press and find yourself a study guide to do with your kids!